ST Suspensions announce their performance coilover for the 2013 Scion FR-S / Subaru BRZ. For those who demand the absolute best performance comes the ST TA coilover. The full driving behaviour of your car can be adjusted using KW damper technology along with an adjustable aluminium uniball top mount for fine-tuning of the camber and caster! ST TA coilovers feature KW damping technology which allows the suspension to be made either stiffer or softer depending on the driving conditions. This damping adjustment is made on the upper end of the chromed piston rod allowing the setup to be changed almost instantly. If the rebound force is increased, the car will drive with even more track stability and further reduced bodyroll. If the rebound force is decreased, the car will feel more comfortable when on the move. For increased performance, the ST TA features an aluminium adjustable topmount allowing the camber and caster to be adjusted depending on your driving needs or vehicle setup. Like all ST coilovers the lowering adjustment is made via a continuous thread on the galvanized strut. This even allows the lowering to be made even when the kit is installed by turning the spring plate higher or lower! NOTE: The lowering of each vehicle differs greatly with ST TA coilovers due to the type of construction. For example, older vehicles such as the Honda Civic (EJ9) can be lowered between 40-75mm with ST TA coilovers, while newer models such as the Audi S3 (8P) can be lowered between 10-40mm due to being much lower from the factory. 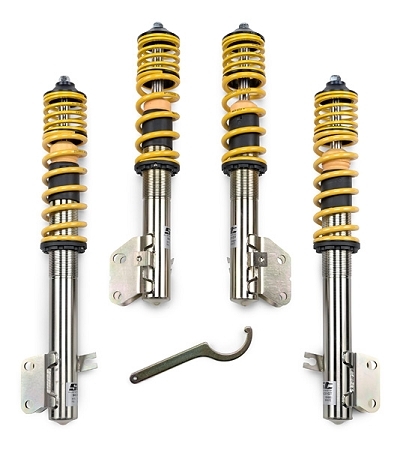 The high-quality ST TA coilover is based on the twin-tube damping principle of low friction combined with pressure-resistant damper housings. Manufactured directly at KW, a mono block guide and seal package reduces the friction of the damper as well as protecting it against corrosion and dirt. Each galvanized strut is sealed multiple times to ensure maximum longevity in ALL weather conditions.